In a healthcare setting, implementing & following stringent infection control policies is critical when food is prepared, stored and served. They are at a higher risk of being sickened by foodborne illness like Listeriosis. 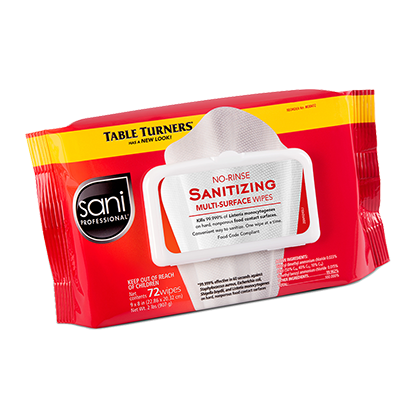 Make Sani Professional® No-Rinse Sanitizing Wipes a key part of your foodservice operations. They're EPA-registered and NSF certified. They're the first and only disposable wipe that effectively kill 99.999% of Listeria monocytogenes on food contact surfaces, along with other common foodborne pathogens. Sani Professional No-Rinse Sanitizing Wipes are so convenient to use when you need them, where you need them, so the food prepared for patients is safe. Sani Professional is a division of PDI, a trusted name in infection prevention. Click Below To Receive Your FREE Sample! You received this email because you are subscribed to Sani Proportions Subscription from Sani Professional .